I spoke at Content Marketing World Sydney this week (an overview of my presentation is here) and have been enjoying the opportunity to start learning about what the content marketing landscape looks like in Australia. In this post, I’m offering up my early assessment of where things stand, who the key players are, and what opportunities I see here. If you’re at all interested in content marketing in Australia, this is a great intro post for you. 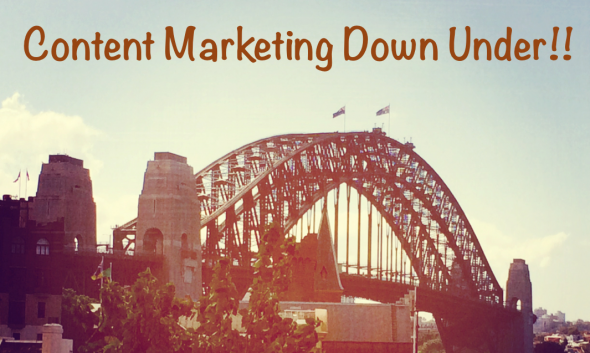 There are two things that you quickly realize about content marketing in Australia. The first is that the community here is significantly smaller than in the United States. Of course, in a country with a population of just 23 million people, that’s a given. Still, to put things in perspective for you, this was the second year that CMW was held in Australia, and it attracted about 350 professionals. By contrast, at CMW in the US this September they are expecting to get more than 2,500 attendees. In all fairness, the conference has been around in the US a few years longer, but that just points to the other big difference in the content marketing landscape between the two countries. The need for a conference in the US arose earlier because content marketing is just further developed there. I’ve heard conflicting reports about where Australia is in its adoption of content marketing that have ranged from just six months to up to four years behind the US. Joe Pulizzi, the founder of the Content Marketing Institute thinks the country is about 18 months behind. My own sense is that it is closer to two to three years. The fact that things are still maturing here became clear to me in part by looking at the keynote speakers at this week’s conference. Only about a third of them were Australian and the rest were imported from the US. Plus, in talking to people, you just get the sense that content marketing is relatively new here. They talk about not having the right terminology yet to describe what they’re doing and of a need to really educate their employers about why content marketing is so important. Sounds like the US circa 2011. Regardless, what’s very obvious to me and everyone else is that content marketing is taking off in a big way in Australia. It’s a great time to be here and to be a part of everything that’s happening. Jeff Bullas (@jeffbullas): I first came across Jeff in my Twitter stream and kept seeing his name pop up again and again. With 227,000 followers, he has a lot of people who want to hear from him and read his content. His site, jeffbullas.com, got more than 4 million page views last year. Jeff is a social media and content strategist and has a very successful consulting business in Sydney. He was also listed as number 11 on Forbes lists of the top social media power influencers in 2013. Carden Calder (@carden): Carden is the managing director of Bluechip Communication, which is Australia’s leading financial services communication firm. Although the firm has traditionally had more of PR and corporate communications slant, Carden is building up its content marketing expertise. She’s the go-to person for all things content and communications in the financial services world. Content Group: (@contentgroup): Based in Canberra, these guys are sharply focused on bringing content marketing to government. They work with clients at the local, state, and federal level and are seeing huge opportunities there. It sounds as though their business is booming and like they have a very bright future ahead of them. Jonathan Crossfield (@kimota): Jonathan is a storyteller, writer, content marketer, consultant and trainer. He recently went out on his own as a content marketing consultant and from what I understand has been very successful and earned the respect of many of his colleagues. His appreciation for storytelling is spot on for anyone interested in succeeding at content marketing. EditorGroup (@EditorGroup): While not a content marketing agency in the traditional sense, the folks at EditorGroup are providing great editorial services like writing, editing, and proofreading. These are the people you want to call when you’ve got to create really big thought leadership pieces or highly technical content that most of the rest of us don’t really get. King Content (@King_Content): King seems to be the content marketing agency to beat in Australia and possibly even Asia. They’ve got about 45 employees and are growing rapidly. CEO Craig Hodges has built a very successful model with some fantastic clients. King doesn’t appear to have any particular area of focus, however, and is instead aggressively going after every industry vertical you can imagine. Michael Kirsten (@michaelkirsten): Michael is new on the scene in Sydney, but brings more than a decade of experience with him. He’s currently the global head of content at Kelly Services and has been responsible for producing much of its award winning content. A native of Germany, he’s a leading content marketer in Europe and will no doubt be on in Australia as well. Mahlab Media (@MahlabMedia): A content marketing and custom publishing agency, Mahlab Media produces content and integrated publishing strategies for brands and associations. With a team of nearly 40, it’s a sizeable agency with a history that dates back to 1997 and an equally long and impressive roster of clients. Sarah Mitchell (@globalcopywrite): If you are in Western Australia, Sarah is someone who you need to know. Based in Fremantle (just outside of Perth), Sarah’s business Global Copywriting provides an array of content creation and content strategy consulting services. She has worked with clients around the world and has deep experience and knowledge in IT. Todd Wheatland (@ToddWheatland): Up until very recently, Todd was the CMO at Kelley Services and based out of their offices in Paris. He returned home to Australia at the end of last year and just joined King Content (see above) as the head of their strategy practice. Todd is a great speaker (he gave an excellent presentation at CMW) and definitely a thought leader in the space. He’s got an incredible brand and is someone to keep an eye on here. Again, my list is far from complete and I suspect some of the people and agencies who made it might describe themselves a bitter differently than I have. You can contact them yourself if you want to find out more. Content marketing is just coming into its own in Australia. As the talent pool deepens and executives become increasingly familiar with how to use content marketing as a tool to attract and retain great customers and drive sales, the appetite for content marketers will only grow. While the Content Marketing Institute has done a fine job of building a community here, I think the Australians really need to take responsibility for that task themselves. If they can continue to learn from each other and others, and take full advantage of the energy and enthusiasm they currently have, it won’t be long until Australia is a content marketing leader. Think you belong on this list? If so, I’d love to hear from you and find out why. Thanks for the mention Kevin. Much appreciated. Thanks also for your presentation on the content matrix. An intelligent approach. Stay in touch. Thanks, David! Look forward to staying in touch. So nice to be identified as a key player in the Australian content marketing industry. Thanks for the excellent mention, Kevin. is, by far, the most impressive and complete Twitter traffic automated product out there on the market today. so it’s wise to stick to your planned schedule. It really helps to do this if you have set up an automated system of tweeting so that you don’t need to go into Twitter each time you want to tweet. The objective is to understand how vital ART, or “Adaptive Resistance Training” is in reaching your full potential in the ring. as take in junk food as well as sit on right now there grows. Football is definitely a sport that requires a combination of skills and athletic ability. It’s a relationship tool and relationships take time to develop. allows you to post not only to Twitter but you can add Facebook, Linked – In and Ping. to fall in line with the desires of the consumer.